The original Left 4 Dead was quick to rise in popularity following its release back in 2008. Developed by Valve Software, the hype around the game was already heightened due to the release of Half-Life 2: Episode 2 and The Orange Box a little over a year prior. Its premise was a group of four survivors teaming up to find safe haven against an endless horde of zombies who had a unique set of different mutations. Players would be required to progress through levels completing objectives, all while scavenging for weapons, ammo, medical items, and so on. If a player was downed or pinned by an enemy, another player would be required to step in to help them. The game did well enough to warrant a sequel a year later. The sequel followed a group four different survivors who were in a different part of the world yet were dealing with the same threat. The sequel introduced new enemy types, weapons, and even core gameplay additions. Since then, there have not been any sequels or further games in the Left 4 Dead series. Many fans of the series have hoped for another game with no success. 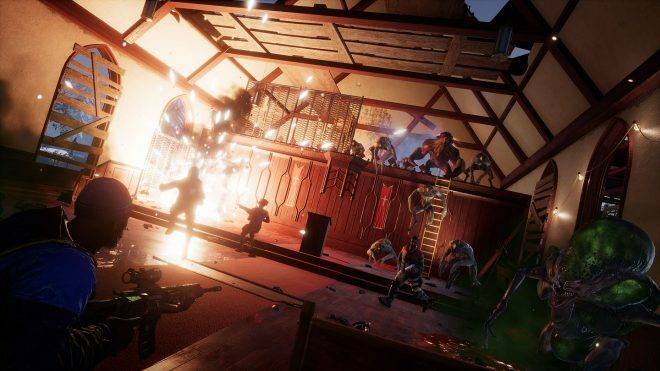 Then along comes developer Holospark, stepping up to the plate with Earthfall, a first-person shooter that recreates the same gameplay style of Left 4 Dead while introducing its own new and unique elements. Does the game deem a worthy successor to the formula, or are we better off leaving the series dead? From the very beginning of Earthfall, you’ll notice quite a few differences and similarities to Left 4 Dead.. Instead of fighting against a zombie horde, you’re fighting against a swarm of aliens. Four survivors have banded together in an attempt to eliminate the alien invaders from Earth: the player will lead Maya, Danny, Lucas and Roy through two different campaigns, each featuring five unique levels. 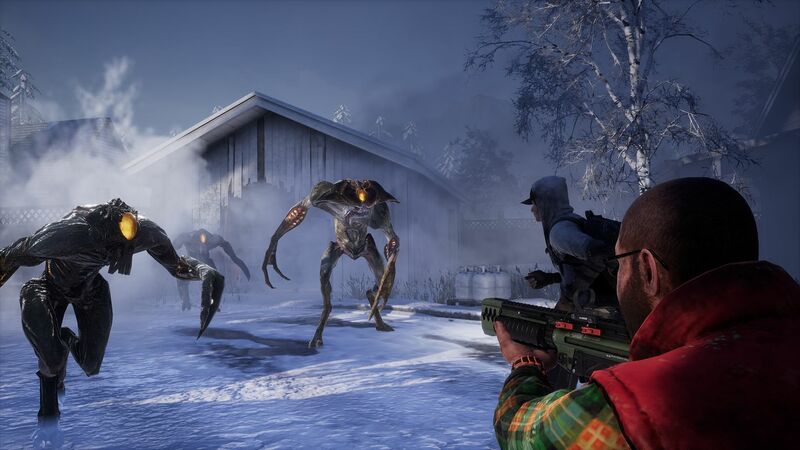 Mutation similarities – The similarities between the complex aliens of Earthfall and the mutated zombies of Left 4 Dead is perfect, almost like an honorable nod. In the original Left 4 Dead, there were five different mutated zombies you would eventually come up against: Hunters, Smokers, Boomers, Tanks, and the Witch. Hunters were famous for leaping across large distances and pouncing on top of a survivor, pinning the survivor to the ground. The Hunter would constantly claw the survivor until a teammate intervened. The Thresher in Earthfall works the exact same way as the Hunter. He’s small, fast, and blends in well with all other enemies. The Boomer was a severely bloated zombie that would purposefully walk upon an unsuspecting player and explode, causing the person – and possibly their team – to be covered in bile which attracted the horde to their position. The Sapper is this same type of enemy. They look like a large walking ball of goop. When they explode, they release toxic gas which disorients and damages the player. The sapper is really a mix of both the Boomer and the Smoker as one, which leaves Holospark to introduce their own unique, standard mutation, the Whiplash. Explaining the look of a Whiplash can be difficult… imagine a baby giraffe, but with an alien-like body and instead of a full face, it just has a mouth. The Whiplash’s main goal is to run in and grab a survivor with its mouth. Once it captures a survivor, the Whiplash immediately escapes the vicinity of the other survivors. Players need to chase down the creature and kill it to free their companion. It’s a very interesting creature, though it always seems to come at the worst time. The Beast is similar to the Tank in every aspect other than the fact he can fire a laser out of his mouth. There are a few other boss-like monsters that appear to constantly change things up. At the present time, we do not have an enemy type relatable to the Witch – though I hope to some future post-launch content add something of that type. Barricades – You’ll quickly learn as you play through the various levels that different objectives will cause you to alert the swarm. Some objectives activate quickly, such as turning on a power relay; others work a bit slower, such as guarding a drill or waiting for a system to reboot. Alerting the swarm draws in a huge mass of enemies to your position consisting of basic aliens, normal mutations, and sometimes a boss alien, all of which can overwhelm your team quickly. Thankfully, with the addition of barricades you can put space between you and them. The barricade is as basic as it comes: pick up the barricade, walk up to a doorway or enclosure and look for the visual representation to turn green and can be placed. Once placed, it creates a gate that allows players to walk in and out of it without issue. Enemies are blocked behind the gate and cannot proceed through until it’s destroyed. The barricade can even be shot through to eliminate some of the bigger enemies. This creates a bottleneck that can be extremely helpful if a Whiplash or Thresher is nearby as they won’t be able to grab you or pounce onto you. Barricades can even be upgraded using a propane tank which activates a flame trap on it, igniting enemies. Heavy Weapons – Alongside the normal weapons that can be carried in your inventory, the game also features a large variety of heavy weapons. These weapons differ in many different ways from your normal weapons. They are heavier, so carrying them will cause your character to move much slower and may require your teammates to cover you more. These weapons cannot be reloaded. Once the ammo reserves are depleted, your character automatically drops the weapon. These are almost always the best choice regardless of the situation. The two weapons available include a minigun and a flamethrower. There are also deployable weapons such as an auto-turret and a mounted turret that a player can use. Choosing to leave behind any one of these weapons can really be a life or death decision. Shorter Levels – One thing that I always disliked about Left 4 Dead was how long some of the levels were. Each campaign would have you going from the start of the campaign to the end, using safe room checkpoints along the way. Thankfully, Earthfall does the entire system in a better way. For the consideration of time, upon reaching the extraction point of a level, the level ends. The game takes you back to the lobby and you simply select the next playable level and launch. This is truly a saving grace for the type of players who may not be able to finish a campaign in one sitting. It also gives them the chance to start right back where they left off. Most levels took about 15 minutes, maybe more, to complete on normal. Higher difficulties would, of course, increase the time quite a bit due to the increase in challenge and enemies. 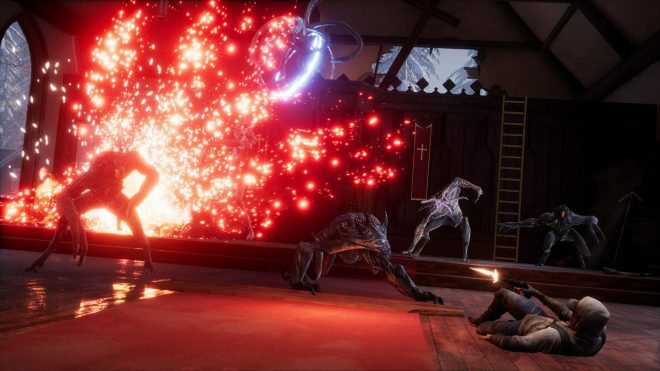 Kill Credit – As you play through the various levels of Earthfall, you come across the different varieties of mutated enemies. A few can be defeated alone, others require the whole team to work together to defeat. Once you actually kill a mutated enemy, the game states who specifically killed the creature. For a game all about teamwork, it feels out of place that the game gives one player credit for a kill. The game shouldn’t be highlighting the player who got the last shot out on the enemy. The game should truly be highlighting everyone who participated in the elimination of the monster. The difference could be helpful in showing whether the entire team was working together to bring down the enemy or if one or more players were slacking; it’s still awarding credit for a kill but would better reflect the team effort. Friendly Fire – Let’s get one thing straight: friendly fire in games, in general, is fine. You want your teammates to have some trigger discipline. The problem with friendly fire here is how badly it works in relation to other mechanics. Let’s take the various monsters for example. Shooting a Thresher off of a teammate is easy considering the creature is laying on top of your teammate. Meanwhile, trying to kill a Whiplash as your teammate dangles from its mouth is difficult as the Whiplash’s movements tend to be sporadic, so at a moment’s notice as it’s running from you, it could suddenly turn back around and cause you to shoot your squad mate. The bigger issue at hand comes from the ability to walk through your teammates. You could be shooting at an enemy and a teammate can potentially run forward passing right through you. You’ll then find yourself shooting your teammate in the back and potentially downing them. It’s very difficult to avoid no matter seemingly no matter what you do. It may seem from the outside looking in that Earthfall isn’t anything special. Looks can be deceiving. 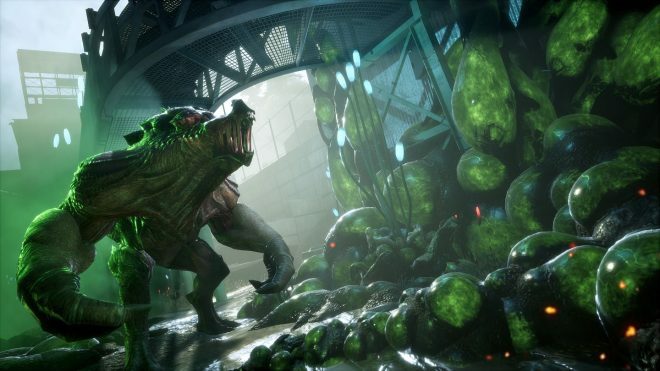 Earthfall is special in the sense that it takes a beloved series with a unique style of gameplay that most assumed to be dead and gave it new life. Left 4 Dead is a series that’s better left to die in the past. 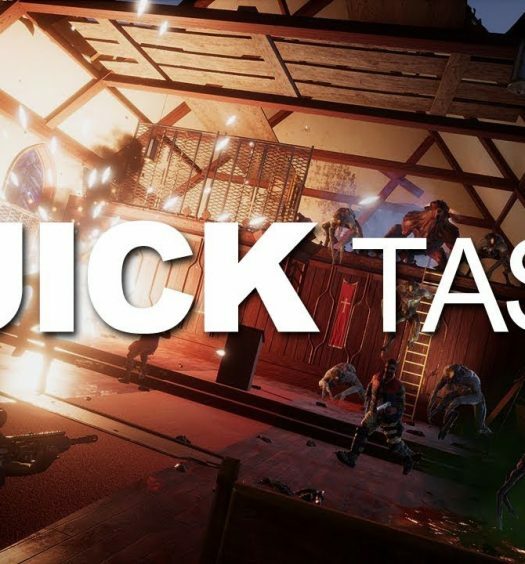 Earthfall is a game that you should give every opportunity to play. Those without anyone to run co-op with can still experience the campaign solo with bots. The game offers a variety of skill levels at which those bots can operate. Holospark has already stated that any post-launch content in regard to levels and game modes will be free, which makes future content worth looking forward to. Do yourself a favor and join in the fun. Don’t let Earth fall into their hands. The time to fight back is now! 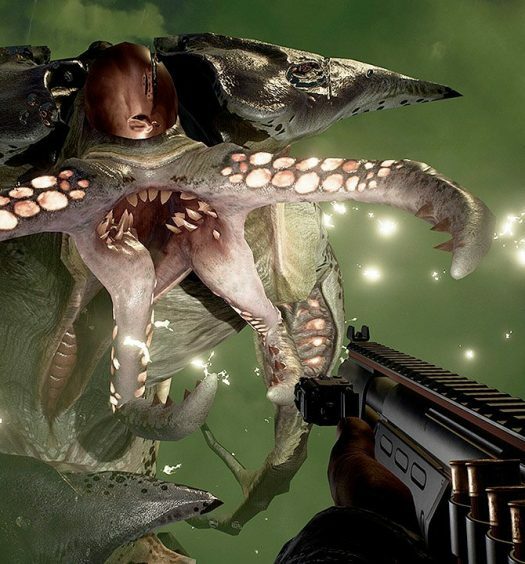 Earthfall was developed and published by Holospark. The game released on July 13, 2018, for $29.99. A copy was provided for review purposes.